Did you enjoy the quarterback preview? Wait, you didn't read it! That's ok. Scroll down, learn something, and scroll back up. Then you'll be ready for more useful stats, facts and opinions - only this time for running backs. Let me put something into perspective for you. Imagine you're at your draft. It's a ten team league. The first pick is taken, and so on down the line. At the end of five rounds, how many running backs do you think have been taken out of the 50 players selected? 12? 15? I was in four leagues last year and when I averaged all four drafts together, the number was 22! I'm assuming this number is similar to yours, especially if you're in a standard scoring league. That's almost half the players picked. What's so interesting about that, you ask? Well, of the top 50 scoring players last year, only 11 were running backs (according to ESPN standard scoring). We drafted twice that many. And yes, I'm a girl who's in four fantasy football leagues. You can stop drooling. In breaking down the data from last season, I'm removing Adrian Peterson from the equation. He had 50 points more than the next running back and including him skews the numbers. He's clearly the first RB off the board and probably the first overall player. Not including Peterson, there were only seven guys who had over 1,000 yards (rushing and receiving) and 10+ touchdowns (rushing and receiving): A. Foster, D. Martin, M. Lynch, A. Morris, R. Rice, S. Ridley, T. Richardson. Of those guys, only Foster, Lynch and Rice had 1,000 yards and 10+ TD's the year before. In fact, the other four guys weren't even in the league. Touchdowns are hard to predict, yet are the primary factor in a running back's fantasy success. According to ESPN's Matthew Berry, from 2002-2011, nearly 200 players had over 10 touchdowns in a season, yet two-thirds of them failed to score 10 touchdowns the next season. So if you do the math, one can assume that only three RB's who scored 10 TD's in 2012 will score 10 TD's in 2013. If you take what's written above to heart, there are only a few running backs who are top tier guys from year to year. That means sleepers are that much more important. The first guy I like is LaMichael James. He averaged 5.0 yards a carry down the stretch last year and had some big plays in the playoffs. Frank Gore is always solid, but he's 30 years old and nearing 2,000 carries for his career. Plus, with Crabtree out, the 49ers are all of the sudden lacking speedy, versatile playmakers and James can fit that mold. I also like Bernard Pierce. He was getting more and more playing time last year as Ray Rice had limited effectiveness and a case of the fumbles. I'm not necessarily predicting it, but I wouldn't be surprised if Pierce is getting more carries than Rice by mid-season. Then there's the rookies: Montee Ball, Le'Veon Bell, Eddie Lacy, Zac Stacy, among others. Ball seems like the consensus rookie pick among your standard fantasy gurus, and I would agree. But if there's a sleeper in the group it's Stacy. He has an inside track to win the Rams starting job with his main competition suspended for Week 1. Not only that, but Stacy played four years against SEC defenses at Vanderbilt and as a junior and senior posted 5.9 and 5.5 yards per carry with a combined 24 TD's. Check out some youtube highlights since Vanderbilt isn't usually the featured college team on Saturdays. Again, I'm disqualifying Adrian Peterson. If you want someone other than AP who's going to get over 1,200 yards, around 10 touchdowns and 200 fantasy points, go with Marshawn Lynch. He has 13 scores inside the five yard line over the last two years and he should continue to get those carries. Don't be turned off by the Seahawks addition of Percy Harvin and the continued development of Russell Wilson either. In fact, this is probably good news for Lynch owners. The more outside weapons defenses have to worry about, the less they can focus on Lynch. And if you're worried about his off-field issues, you shouldn't have to be until late December. Last season (and really for a few seasons before that) it was trendy to say the NFL was a passing league. If the NFL was an US Weekly issue, "passing league" would of been a cover story from August to January. But by the time the lights went out in New Orleans, the trend had seemed to shift. Certain football minds were starting to say that effective rushing attacks were even more important than passing. That train of thought is likely to continue into this season with the emergence of running quarterbacks and Adrian Peterson's silly numbers and more teams testing out the read option in training camp. Don't be fooled when it comes to fantasy! There are still only a handful of RB's that you can count on to get 15+ fantasy points a game for you, and that's assuming they don't get hurt. Read those numbers at the top again. You can count on two hands the number of guys who had 1,000 yards and 10 touchdowns last year and history tells us more than half of them won't score as many TD's this year. If you want two good starting running backs you better get them early. A productive quarterback will be there down the line. I know what you're thinking. Another article ranking fantasy football players. They're about as common as "North West" jokes these days. Well don't worry, I agree. That's why my fantasy preview isn't your traditional list of things you already know, like that Tom Brady is a good quarterback and that Adrian Peterson is a robot. I'll give you stats, facts, historical data, and a few opinions. I'll drop one every Sunday from now until August - just in time for your draft. Quarterbacks are up first! Of the top 30 scoring leaders in 2012, 20 were quarterbacks (ESPN standard scoring). This includes the likes of Josh Freeman (#17), Carson Palmer (#23), and Ryan Fitzpatrick (#29). Yes, you read that correctly. Carson Palmer, a guy who I blew past in my drafts last year without a second thought, had more fantasy points than Calvin Johnson, Brandon Marshall, Ray Rice, and Dez Bryant. However, the difference in point totals between Drew Brees - who was #1 in total scoring - and Ryan Fitzpatrick, was 136 points! If you average that out through a standard regular season (13 games), it translates to almost 10.5 more points a game from Brees. That translates to a lot more wins. Not only was there a substantial drop from Brees to Fitz, but there was a 20 point drop in total scoring from the 3rd highest quarterback (A. Rodgers) to the 4th highest (C. Newton). There was also a 20 point drop from the 7th (M. Ryan) to the 8th (T. Romo). And again, a 20 point drop from 11th (R. Wilson) to the 12th (A. Dalton). Don't expect a guy you've never heard of to make a big fantasy impact. That might happen with running backs and receivers, but not with quarterbacks. So identifying sleepers is kind of a waste of time. That said, there are guys who can make the fantasy leap. Look at Matt Ryan in 2012, or Matthew Stafford in 2011. If I had to pick a leaper in 2013 - other than the obvious Colin Kaepernick - it's Sam Bradford. The Rams added Jake Long to help the offensive line, and Tavon Austin, Stedman Bailey and Jared Cook to give Bradford more weapons. This will also be Bradford's first NFL season with the same offensive coordinator from the year before. Aaron Rodgers. He's been a top-three fantasy QB for five years in a row and is only 29 years old. Yes, the offensive line has problems, but that didn't stop him last year from putting up 39 TD's to only 8 INT's. And yes, there's no more Greg Jennings, but Jennings had a total of 57 fantasy points last season (with 34 of them coming in week 16 and 17). So needless to say, Rodgers didn't miss him last year. I'm sure he won't miss him this year either. If Rodgers is on the board, he's got to be yours. Go back to the first stat from this post. Of the top 30 scorers in 2012, 20 were QB's. What does that mean? One word: depth. If you're picking early and Rodgers or Brees are there, my advice is to take them. The elite level of consistency they bring is too good to pass up. However, think of the guys you could get in rounds 2, 3, or even 4 that would be solid starters: Newton, RGIII, Wilson, Kaepernick, Luck, Ryan, Stafford, Romo. All of these guys averaged 16 points a game or more last season in ESPN scoring. And that list doesn't include Eli, Big Ben, or Joe Flacco (who would want to remind us that Cam Cameron is not his offensive coordinator anymore and he threw 15 TD's and 1 INT to close out last season's Super Bowl run). Are there drops from the "super-elite" group, to the "very very good" group, to the "random guy in the league" group? Of course. Like I said above, expect a 20 point dip from class to class, but if you average that 20 points out across 13 games, it's a point and a half difference a week. Maybe Carson Palmer isn't such a bad idea after all. Do you ever wonder how good athletes would be if they played a different sport? Maybe Allen Iverson would of been the best soccer player ever with his tremendous speed, quickness and agility. Perhaps Andre Agassi would of broken Pete Rose's hits record with his superior hand-eye coordination and smooth swing. Of course, we'll never know. But it's fun to guess! These are my best guesses as to what current non-football athletes would make the best football players. Just for fun, I broke it out as if it were a fantasy football roster with starters by position and a bench. OMG I'm craving football! RB : Eric Staal -- Center, Carolina Hurricanes (Hockey) -- At 6'4" and 205 lbs. Staal would be a perfect running back. He's big, fast, and has great vision, evident by his 35 assists in the shortened NHL season (6th in the league). And since he's a hockey player he must be tough as nails. RB : Rafael Nadal -- Men's Tennis Player, Spain (Tennis) -- Nadal is 6'1", 190 lbs., and plays like a bull. He's fast, aggressive and smart - perhaps the three best qualities a running back can have. WR : Russell Westbrook -- Guard, Oklahoma City Thunder (Basketball) -- Of all the players on this list, I think Westbrook missed his calling the most. Maybe it's because he plays with Kevin Durant and will always be overshadowed by his teammate, or maybe it's because he could of been the best receiver of all-time. Imagine the 6'3" guard running like a deer down the field and out-jumping the poor cornerback trying to cover him. He'd be a cross between Victor Cruz and Dez Bryant. Yikes! WR : Matt Kemp -- Center Fielder, Los Angeles Dodgers (Baseball) -- Kemp's nickname is "The Bison" because of his imposing size and his surprising speed. It's very unusual for a guy who's 6'2", 225 lbs. to steal as many bases as he does. What receiver would he compare to? Andre Johnson comes to mind. WR : Mike Trout -- Center Fielder, Los Angeles Angels (Baseball) -- Down the highway from Kemp is Mike Trout, who many consider the best player in baseball and he's only 21. He might have been the best player in football if his dad - a former baseball player - didn't convince him follow in his footsteps. Wikipedia is the best. TE : LeBron James -- Forward, Miami Heat (Basketball) -- How amazing would this be? Combine the speed of Vernon Davis, the length of Calvin Johnson, the hands of Rob Gronkowski, the agility of C.J. Spiller, and the strength of Clay Matthews. That's LeBron. He might be as unstoppable in the NFL as he is in the NBA. WR / RB : Usain Bolt -- Sprinter, Jamaica (Track & Field) -- Bolt had to make the team somewhere. The fastest human in history would definitely be a great flex player. K : Cristiano Ronaldo -- Forward, Real Madrid (Soccer) -- Pretty boy Ronaldo would be a great kicker. He could trot onto the field a few times a game and use his canon leg to boom field goals and the rest of the time could sit on the sidelines pampering himself. Bench QB : Jeff Francoeur -- Right Fielder, Kansas City Royals (Baseball) -- Francoeur has a rocket arm and pinpoint accuracy. In SI.com's ranking of the best arms in baseball, Francoeur was the runaway winner. Bench RB : Mario Balotelli -- Forward, AC Milan (Soccer) -- Balotelli is a 6'2", 195 lbs. hot-headed wild man with amazing bursts of speed and power. Bench WR : Kevin Durant -- Forward, Oklahoma City Thunder (Basketball) -- Take all of Calvin Johnson - 235 lbs. of speed, hands and hops - and then add 4 more inches. The Chik's Favorite Football Fanatic! Congratulations to "Tim Bear"... otherwise known as "T-BONE"... on being my first ever Favorite Football Fanatic!! Anyone who's cool enough to have 2 nicknames - one of which references a Seinfeld episode - is someone I'd want to tailgate with! Tim says his friends call him T-BONE, so that's what I'm calling him now. He's been a Colts season ticket holder since '96 and sets the alarm for 5am on gamedays. That's serious tailgate dedication. But what set him apart from everyone else was the jersey he's wearing. Only a true Colts fan would actually purchase a Curtis Painter jersey! Thanks, T-BONE! And thanks to everyone who participated in My Favorite Football Fanatic!! Tom Brady -- QB, New England Patriots -- The Texans went to Foxboro a month ago and lost 42-14. They gave up 296 yards and 4 touchdowns to Brady. I'm expecting more of the same this weekend. Brady will have Hernandez AND Gronkowski this time, which means the Texans banged up linebackers and average secondary will be scrambling to cover them both. Cincinnati would have beaten Houston last week if they could have converted their big plays, but Dalton couldn't do it. Tom Brady is not Andy Dalton. 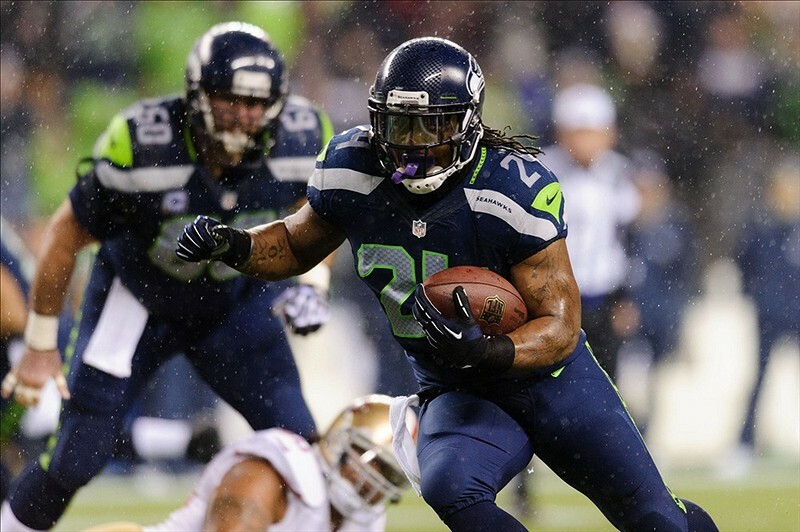 Marshawn Lynch -- RB, Seattle Seahawks -- 2012 was Lynch's career year, and so far that's continued in 2013. Last week he had 132 yards against a Redskins team that was actually good at run defense This week he's playing a Falcons front seven that is flat out bad against the run. They gave up 4.8 yards a carry (29th in the league) and 123 yards a game (21st in the league). Look for Beast Mode to once again be a fantasy stud. Michael Crabtree -- WR, San Francisco 49ers -- Michael Crabtree's new best friend is Colin Kaepernick. Since Kaep was named the starter, Crabtree has led the Niners in receiving yards 6 out of 8 games. In the 8 games Alex Smith started, Crabtree only led the team 3 times. He's scored 6 touchdowns in that stretch, compared to 3 with Smith. Granted, the injury to Mario Manningham may also be playing a role in Crabtree's emergence, but that's no fault of his. Dennis Pitta -- TE, Baltimore Ravens -- If there's an area on defense that the Broncos are not good, it's covering tight ends. They give up an average of 8 passes and 60 yards to tight ends a game. Compare that to Kansas City (the team with the worst record in the league), who gave up about 5.5 catches a game and 45 yards. When the Ravens played the Broncos in Week 15 they lost 34-17, but Pitta had 7 catches for 125 yards and 2 TD's. If Baltimore has a chance to beat Denver in Mile High, Pitta will have to produce. New England Patriots -- D/ST -- Houston's offense is good enough to beat the Cincinnati's of the league with Arian Foster having a big day - but to beat a team like New England they need to have more going than just Foster. That's where Matt Schaub comes in, and unfortunately for the Texans, Schaub has been - to put it mildly - not good lately. I think Brady (see above) will be able to put up points against the Houston defense, which means Schaub will be forced to keep up. That's not the recipe the Texans will want to use in this game, but it is the recipe that gives the Patriots the most chances for sacks, interceptions and big plays.